SALISBURY — Rowan Crosby Scholars’ fourth “BBQ, Bands & Boots” fundraiser on Sept. 29 was a festive celebration of the program’s first five years and a gleeful gathering of the community that has supported its mission of building a college-going culture in Rowan County. 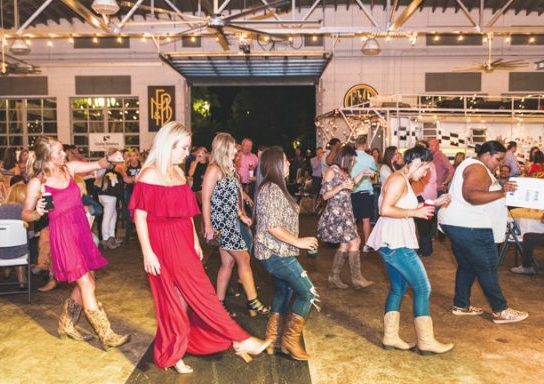 In 2017, the program took a year off from hosting the event to focus on a capital campaign for Last Dollar Grants, but after receiving requests from the community to bring it back, BBQ, Bands, & Boots was “re-BOOT-ed” in 2018. Guests were greeted by dozens of high school Crosby Scholars clad in cowboy hats, bandanas and the Rowan County program’s signature black, white and red t-shirts. As supporters entered the F&M Trolley Barn, they enjoyed Jim ‘N Nicks delicious smoked barbecue pork, chicken and sides, while grooving to the live music of acoustic guitar duo, Melonbelly. Top-shelf bourbon was served from a uniquely decorated bread truck, meanwhile attendees could compete in a rousing game of Heads and Tails and even a round of corn hole. All through the evening, a large screen displayed the program’s success stories and dozens of smiling photos of graduates currently attending college and benefiting from a Last Dollar Grant. Proceeds from BBQ, Bands & Boots will directly support Crosby Scholars’ Last Dollar Grant program, which will help offset unmet financial need for college-going Crosby Scholars. The program has graduated over 500 seniors since 2016 and awarded more than $250,000 in Last Dollar Grants to students attending 45 different colleges and universities across the country. Crosby Scholars is a free college access program available to all Rowan County public school students beginning in sixth grade and continuing through high school graduation. The program helps students prepare academically, personally, and financially for college and for life. Tenth grade is the last chance for a student to join the program. The deadline to enroll online this year is Friday. To learn more about the Crosby Scholars program in Rowan County, its mission and how you might become involved, please visit www.crosbyscholarsrowan.org or call 704-762-3512.